What if all your personal records, including your relevant personal health and care records were held in one place that you control? It was suggested that this personal data store, which we have called a ‘Backpack’, could make it easier to access health and care services, and support services to be centred around the wishes and needs of the person. Design researchers from The Innovation School at The Glasgow School of Art worked together with a community interest company (Mydex CIC) and a health professional (Dr. Jamie Hogg, NHS Grampian) to explore and develop the Backpack idea with people living with Multiple Sclerosis (MS) and with health and social care staff. People living with MS were identified as highly knowledgeable co-design participants, due to the complex and progressive nature of the condition, requiring many different interactions with public services. 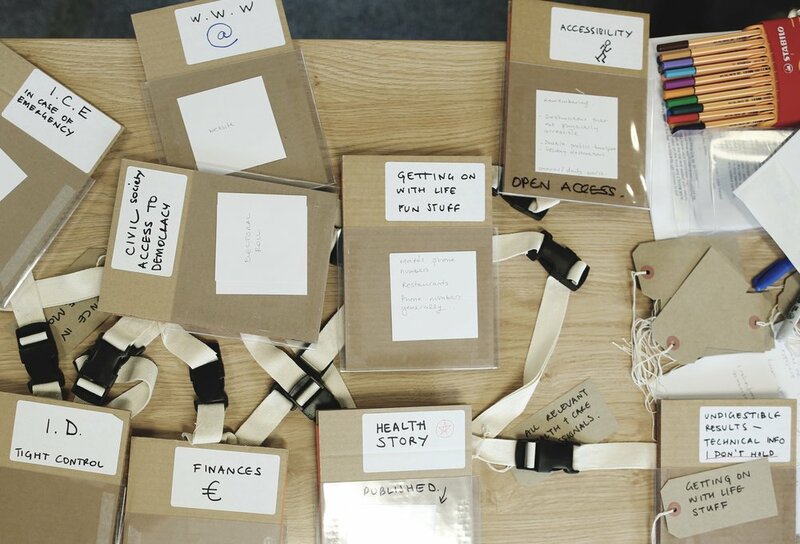 The aims of the project were to explore how people living with Multiple Sclerosis (MS) would like to manage their personal information in order to improve the experience of accessing services, and understand the potential of the Backpack to support health and care professionals to deliver more integrated and person-centred care. A focus group was held with five people who live with MS, recruited through the local MS support group. The focus group aimed to gain insight into current experiences of living with MS, in particular the challenges of and strategies for managing personal information and accessing support from statutory services. We aimed to identify several key moments of data sharing between people living with MS and health and care services to be explored in more detail during Lab 1. Experience Lab 1 was a half-day session with people living with MS (three participants). Design-led activities mapped key moments of data-sharing and developed a paper based prototype of the PDS, followed by a focus group to get feedback on the PDS concept and elicit issues around personal control over personal data. Experience Lab 2 was a half-day session with health and care professionals (four participants). The aims of the Lab were to test the Backpack concept with service providers, gather user requirements from the perspective of service providers, and understand how access to a PDS would change current working practices. 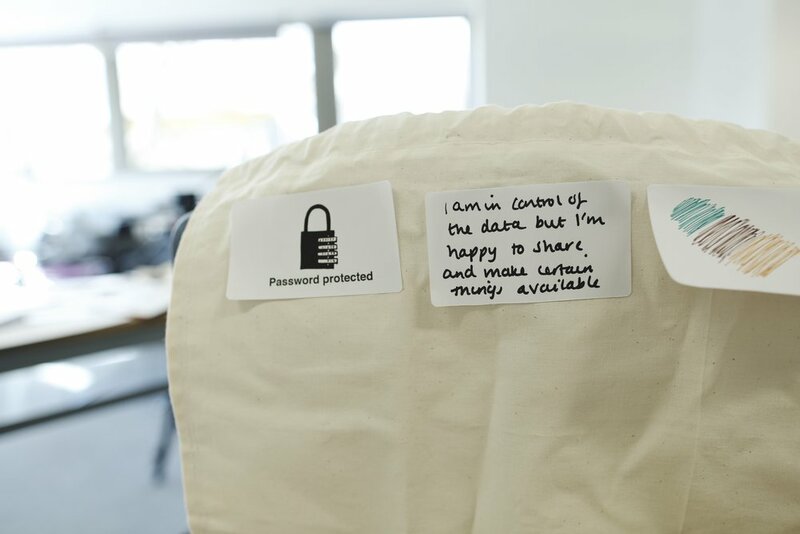 Both people living with MS and health and care professionals were very positive about the concept of the Backpack, and saw how it could be used to improve communication and make services more person-centred. We learned some general qualities people living with MS value from the people and services that support them. Services should be orientated around their personal goals and needs, and should seek to offer convenience to make everyday life easier. People valued services and places that felt safe and welcoming; and professionals who showed understanding about the challenges of living with MS, and were knowledgeable about the people and services that could help. Participants would value the ability to access their own health information, with equitable access to the information their health professional holds about them. They also told us that health professionals working in different services or health boards do not always share health information, and suggested that the Backpack would allow them to ensure their health professionals had access to all the relevant information. While they might not want to see lots of medical jargon, they would want to see their high level test results and have the ability to access the detail if required, e.g. to share with a health professional in a different region. While security of online information is a concern, participants were pragmatic about the benefits of having access to a shareable digital data store, versus the risks. The Backpack must make use of familiar and trusted security measures, without the need for complicated passwords. A key value of the Backpack is the ability to reflect the personality and interests of the owner. This concept was embodied in the paper backpacks made in Lab 1, where “fun stuff” or personal interests were a feature of all, and for one particular participant this became the centre of their Backpack. This supports the need to ensure the Backpack can accommodate this information to facilitate everyday life and activities. Health and care professionals would also value this information, supporting them to understand what the person enjoys and tailor their care to their aspirations. In addition the Backpack should be adaptive and anticipate the needs of the person as their health and care requirements change. 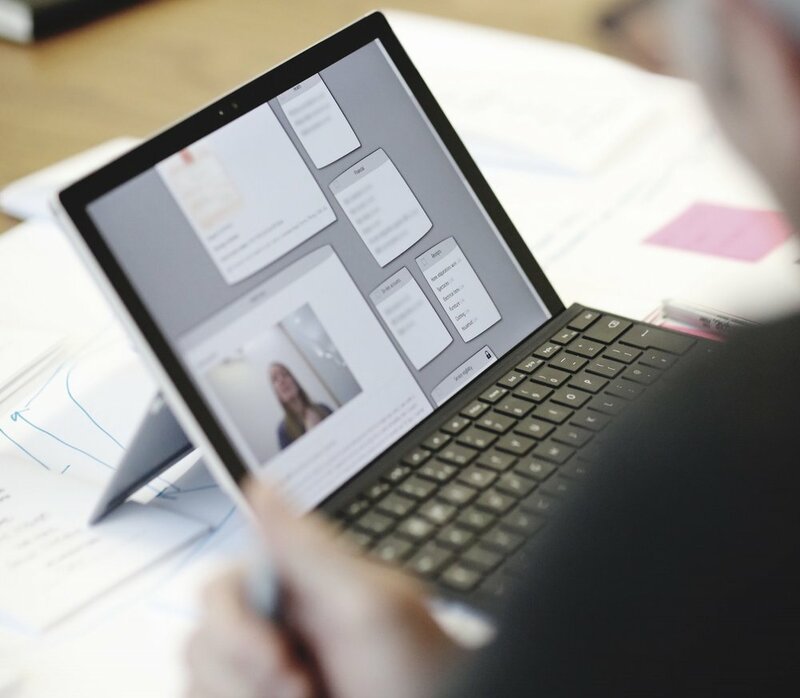 Four design concepts were created in response to key insights or challenges. The health and care system is very complex and it is often challenging to find the person or service that can help. The Backpack should map the care interactions around the person, providing high-level information to make visible the complex network of professionals supporting the person. This would allow the person, their family and their health and care professionals to see the care that is currently in place, providing contact details and a short summary of the support they are providing. This could be shown as a circle of care or on a timeline. People living with MS described having to recount their ‘story’ every time they connect with a professional or service, which is emotionally draining and time-consuming. A 'Health Story' would provide a space within the Backpack for the person to share their story in their own words, using video or written narrative, supported by key dates and facts. People living with MS described the challenge and emotional cost of navigating complex services to find the right information, people and services. Eligibility criteria and forms seem to be deliberately confusing, deficit-based and require significant energy to complete, which is already in short supply for people living with MS. The Backpack could gradually fill up with information as the person completes forms and could automatically draw in data from existing sources. The Backpack could intelligently compare data against eligibility criteria, highlighting any appropriate services they may be entitled to access. Information could be verified through the Backpack (e.g. this person is on the MS Scottish Register) to automatically prove eligibility for services (e.g. Blue Badge for parking). In Case of Emergency and power of attorney rules can be set up in advance to allow the person to transfer ownership of the Backpack and give access to their nominated person. The MS nurse manages a very large case load of patients and does not receive information when there has been a change in their situation (e.g. an admission to hospital) or the outcome of a referral to another service. With permission from the Backpack owner, the system would notify the nurse of any changes in their condition or circumstances recorded by the person or their health and care professionals. These patients would be shown at the top of the list to enable the nurse to better manage their caseload prioritising people who may need their support. The nurse would be able to send out emails to all their patients via the Backpack. This project has been taken forward into the current DHI portfolio of projects where we are building a 'Person-Owned Data Store' and developing prototypes and demonstrations of new concepts for care enabled by person-owned data. We are also working to translate the Backpack project outputs into the DHI Demonstration Environment to allow us to communicate the future vision using 'after' stories to bring the future vision to life and show the impact person-owned data would have on experiences of care. We are also currently exploring how the design concepts generated through this project can be taken forward in the DHI 'Future of Care' project. Essential to this process will be the meaningful involvement of people living with long-term conditions and NHS staff to ensure the resulting resources meet the needs of the different users and stakeholders. Early and iterative prototyping will be used to translate the design concepts into tangible forms that can be tested and refined by the intended users to understand how they might support self management, service delivery and positive experiences of care. We would like to thank all of our participants for giving up their valuable time to take part in the Experience Labs.